I also love crepes! and peaches are MY favorite fruit of all time!!! i haven't had a REAL fresh peach since i lived in utah! it is soo sad! anyways, those look divine of course, as always! mmm good! LOVE YA! That's it! 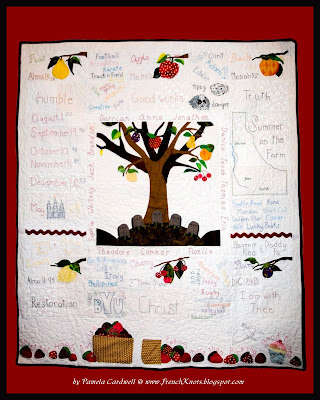 I want to go strawberry picking now!!! "a bit of sugar" try a dump load of sugar because that makes it taste that much better! 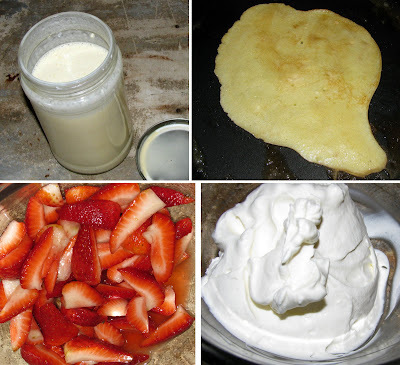 Sometimes when I have strawberries but no whipped cream, I take sour cream, add some sugar, mix, and then toss in strawberries. I know it sounds a bit odd, but it's really good! Mmm. . . I love crepes. 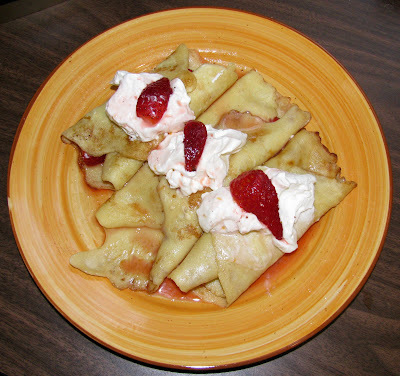 My family used to make crepes with a sweetened cream cheese filling (I guess they were more of a blintz, but nevertheless, delicious).